Just how dark will House go toward the end of its eighth season run? Fox may have just given us an idea. The network has revealed that the title of this drama's May 21 series finale is a play on its main character's favorite saying: Everybody Dies. Combine this news with the title of the April 30 installment, "The C-Word," and speculation is rampant that House will come down with cancer. But will the show actually kill him off?!? Creator David Shore will write the finale, and it's been confirmed that a few familiar faces will appear on it, including Olivia Wilde, who will reprise the role of Thirteen on both the closing episode and the May 14 installment. What do you think? 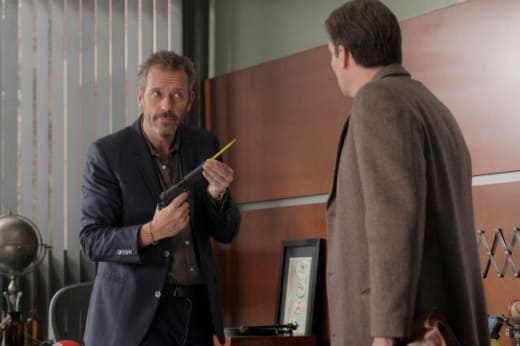 Do you want to see House killed off on the series finale? Yes, it would be the perfect dark conclusion! No, it would be way too depressing!